Last weekend, Betsy and I were in the kitchen with a couple different projects. I was working on some banana chocolate chip cupcakes, and she was making some chocolate cupcakes with cookies ‘n’ cream frosting. I attempted to make a dulce de leche filling to stuff into the center of my cupcakes. After an hour’s work, the dulce was a total fail. I’m not even going to post the recipe here until I manage to make it successfully. Then I ran of out of steam, so I just passed off the cupcakes as muffins by not filling or topping them. Lazy. When I was boiling the milk and sugar for the dulce de leche, it boiled over into a huge mess. Betsy and I both rushed to clean it up, but it was bad. Burnt milk everywhere, smoke, and stained towels. 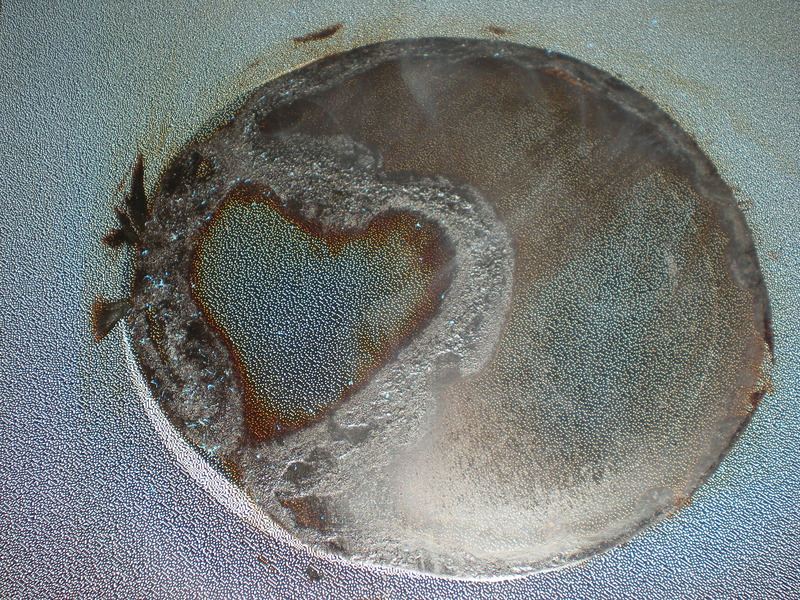 But when we finished up, we noticed this cute little heart looking up at us from the stove top, like a hippie Grilled Cheesus. It’s still there, actually. I scrubbed and scrubbed, but it will not come off. Obviously, this is a sign: All you need is burnt sugar milk love.